Best View in Brooklyn: Reminder: Youth Baseball Sign-Ups are NOW! Reminder: Youth Baseball Sign-Ups are NOW! 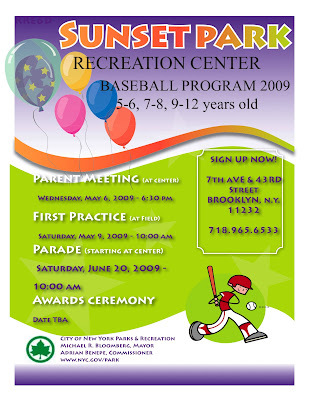 If you have a baseball-loving child between 5 and 12 years old, check out the flyer below and call the Rec Center at 718 965 6533 to find out how you can sign up. It's free, it's outside, it's fun. Click on the image to see a larger version.